Thank you for sending your blocks so promptly. I will be on holidays for the next 3 weeks, but will stay in contact with those at home and hopefully be able to post the arrivals as soon as possible. I can’t wait to see your blocks and begin to play with possible designs. Here is the finished results from my winning month last fall. 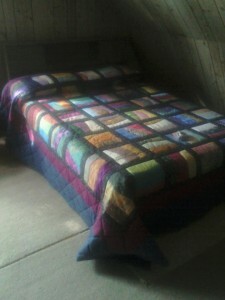 The rails are complete, hand quilted and ready to use. I simply LOVE the final result. The colors are so vibrant. Thanks to all who made some of the blocks. I love how the curved rails look with the dark borders and sashing. Nice Job! I added the category show & tell to your post so that your quilt will be featured in the home page and appear in the gallery … and I removed it from the category blocks.